History, La Tene Metalwork Designs, Techniques. This period of La Tene Culture marks the zenith of Celtic Cuture in Europe. It is traditionally divided into three cultural periods: The Waldalgesheim Style (c.350-290 BCE), The Plastic Style (290-190 BCE) and The Sword Style (190 BCE onwards. The great historic invasion which brought the Celts to Rome early in the fourth century BCE culminated in the occupation of the greater part of northern Italy. As a result, a new style of decorative Celtic art developed and spread. The weapons and jewellery discovered in Celtic burials in Italy are good illustrations of this new style, the main elements of which were foliage motifs, especially tendril scrolls. Hence one of its names: continuous foliage pattern. It is also known as the Waldalgesheim Style, after an important archeological site in Germany. A feature of this prevailing trend in the fourth century BCE was the adoption and transformation of motifs of Greco-Etruscan origin. The most striking examples are the two ceremonial helmets discovered in France-at Agris and Amfreville-sous-les-Monts-both found outside the area of expansion of Celtic art in the fifth century BCE. The strong Italic influence on the transalpine Celts is clearly apparent, too, in a series of painted vases found in Champagne (France), dating from the fourth century BCE and probably produced in the same workshop. 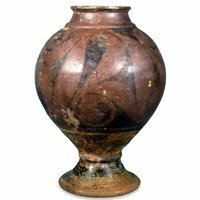 Their curvilinear decoration was executed, as on Greek and Etruscan vases, by blacking out the field and leaving the pattern in the colour of the clay (the "red-figure" style). This early attempt was followed a little later by a second series, found in Champagne, comprising ceramics in the "black-figure" style. See Prunay Vase, pictured left. The emergence of this new foliage pattern in the fourth century BCE is evidence of the assimilation and interpretation by the Celts of the ornamental repertoire of classical Greek art, one of the foremost elements of which was the Greek or Etruscan palmette and its composite forms, with tendril scrolls. Fibulae discovered in Switzerland are closely akin to the Mediterranean prototypes, but the famous gold torc found at Waldalgesheim differs considerably. La Tene Art: "Plastic Style"
The most important innovation of Celtic art in the fourth century BCE, which became one of its main features, was undoubtedly the process known as plastic metamorphosis. This type of representation is ambiguous since the foliage pattern conceals, and at the same time evokes, a human face (often caricatured), a mask, or animal heads. It therefore represents a fleeting vision, in other words, it may be interpreted in two ways. As a result of the movement of the Celts between the different regions of non-Mediterranean Europe and northern Italy, and their successive migrations eastwards to the Carpathian Basin, the fourth century BCE decorative style spread rapidly. The engraved decoration of a fine piece of pottery from Armorica in France, showing an elegant interpretation of the frieze of palmettes, reflects the influence of Greco-Etruscan motifs at the western confines of the Continent. The decoration of an iron spearhead found in Hungary is very similar to that of the Waldalgesheim torc. The spread of this style seems to have followed Celtic expansion not only eastwards, but south-eastwards too and the fine gold torc with continuous tendril scrolls, found at Cibar Varos (Bulgaria), is the earliest evidence of the presence of Celts in Thrace. This style was not, however, adopted immediately. Besides important finds scattered between Brittany and Bulgaria, evidence of its influence on local production also may be observed. The geometrical repertoire of the stamped pottery found widely in Bavaria, Bohemia, Austria and the Carpathian Basin was enriched by elements of the new foliage pattern. The motif stamped on a vase discovered in Hungary is a simplified version of the tendril scroll to be seen, for example, on a bronze handle-attachment found in Comacchio (Italy), while the pattern incised on another vase found in Hungary was copied from a metal object. From the last decade of the fourth century BCE onwards, the Celtic advance weighed more and more heavily on the whole of the north-eastern Balkans and threatened Greece as well. This change in direction was reflected in Celtic art, despite the failure of the great Celtic expedition against the Greek world in 279 BCE. The grave of a military chieftain in the Ciumesti cemetery (Romania) on the border of the Hungarian plain affords very clear evidence of this orientation towards the Balkans, since the grave goods include Greek bronze shin-guards. The roundels of the mail attest to the change in taste, for the embossed motifs owe more to the survival of elements of the Early Celtic style than to the continuous foliage pattern. The third century BCE heralded the growing role of the plastic arts, for example, the extraordinary Ciumesti helmet which is topped by a bird - a crow rather than an eagle - with mobile wings and enamel eyes. La Tene Art: "Sword Style"
By the first half of the third century BCE the Danubian Celts had become a dynamic force through the absorption of heterogeneous elements from territories extending from the Atlantic to the Carpathian mountains. All these movements to and fro are reflected, inter alia, in the diffusion of scabbards decorated with heraldic pairs of fabulous animals-dragons, griffins and birds of oriental inspiration, which probably originated in Italy. These works are to be found throughout the whole of the Continental region covered by the Celts, from Normandy in the west as far as Transylvania in the east, from around Warsaw in the north to Belgrade in the south, not to mention northern Italy. To complete the picture, similarly decorated scabbards have been discovered in the River Thames (England). This new trend in the Celtic world explains the remarkable development of the middle Danube region during the third century BCE - one of the finest periods in Celtic art. The Danubian scabbards decorated with spirals of delicately intertwined foliage and other elements of plant or animal life, forming a continuous pattern of curves and counter-curves, represent a new style known as the "Hungarian Sword Style". It was brought to perfection in the scabbard found at Cernon-sur-Coole (France), the closest parallel to which was discovered at Drna (Czech Republic). The motif most characteristic of these scabbards - the crested head of a fantastical bird - also appears on a fibula found at Conflans (France), which bears witness to the virtuosity of the Celts in the working of iron. The "Hungarian" and "Yugoslav" sword scabbards display new and unexpected variations on foliage motifs. The complicated interlacings are sometimes associated with animal elements, here only distantly related to the prototypes which can be observed on items decorated in the continuous foliage pattern of the fourth century BCE. In some cases, the pair of fabulous animals fuses with the decoration typical of the "Hungarian" swords. It will be noted that towards the end of the third century BCE, foliage and floral patterns become geometric to a certain degree. The "Swiss Sword Style" represents a contemporary trend comparable to the "Hungarian Sword Style", but with marked differences. The decoration is less abstract, as may be seen from the La Tene scabbard on which three animals in slight relief are depicted in a fanciful way with incised tendril scrolls planing a secondary role in the composition. Even the running scrolls of tendrils on the "Swiss" swords are closer to the Italian prototypes than to the Hungarian variety. The importance of a symmetrical composition is another noteworthy feature of the "Swiss" swords. The emergence in Central Europe of the Plastic Style, one of the most original manifestations of early Celtic art, was also due to the eastward shift in the centre of gravity of the Celtic world. A few rare objects scattered between the middle Danube region and south-west France give some idea of the refinement of the products of the Celtic workshops. The gold torc and bracelets are sumptuous works, especially the bracelet found in Aurillac (France) with its striking profusion of flowers, buds and leaves. The Lasgraisses torc is made up of flowers interlaced in a double torsade and this ornament was probably inspired by Hellenistic jewellery. The precursory signs of the Plastic Style appear in metalwork such as the bronze bracelets and fibulae found in Bohemia (Czech Republic) and on the bronze torc found in the Rhineland area of the Federal Republic of Germany. Although this first series obviously derives from the fourth century BCE, objects with foliage decoration, direct allusions to the continuous foliage pattern, are rare. The transformed elements, like the scroll-work, are in marked relief and although the basic element - the lyre - does not change, S-motifs and triskeles are increasingly important in these plastic compositions. The Plastic Style was brought to perfection in bronze ornaments, chiefly pairs of anklets, but also bracelets, some hundreds of which originated in Bohemia and Moravia. Their decoration, based principally on S-motifs, triskeles and combinations of these forms, along with the yin-yang as an innovation, is often in very high relief - in some cases almost fully in the round. The composition of the most baroque specimens gives the effect of an exercise in solid geometry. The purpose of this plastic form elaborated during the third century BCE was not merely decorative. Certain motifs constantly recur throughout the Celtic world. The human face, expressive and sometimes caricatured, appears among S-motifs and knobbed spirals on parts of chariots unearthed in area extending from France to Bulgaria. The openwork decoration of the Brno-Malomerice specimen, with its plastic vituosity, lends an eerie character to the human masks. The ornamental repertoire used in Celtic art of the third century BCE is not lacking in incredible monsters or in real animals. The birds of prey that adorn the rim of a cauldron found at Bra are stylized and at the same time highly expressive. They undoubtedly served the same purpose as the griffin handle-ring on the cover of the vase found at Brno-Malomerice (Czech Republic). The drinking-horn in the form of a dragon, found in Hungary, is particularly interesting as the animal motif which harks back to the Hellenistic Ketos or sea monster. The art of the Carpathian Basin during the third century BCE was open to Balkan influences and it owes its filigree and granulation techniques, little known in the western La Tene regions, to the Thracian-Illyrian cultural sphere. The most striking example is the hoard unearthed in Szarazd-Regoly (Hungary), which illustrates the Celto-Illyrian cultural amalgam. The fashion for bronze jewellery decorated with imitation filigree flourished shortly before the middle of the third century BCE, inspired by objects found commonly throughout the Carpathian Basin and in Moravia. The bracelet discovered in Chotfn (Czech Republic), a masterpiece in this style, gives the illusion of true filigree-work. The influence of metal vases of Hellenistic origin introduced new forms into the ornamental repertoire of eastern Celtic pottery. One type of Danubian kanthar (third century BCE), imitates Greek prototypes and it was during the same period that kantharoi with theriomorphic and anthropomorphic handles first appeared. Vessels on which a human figure serves as a handle evoke Etrusco-Italic models. The kantharoi represent one of the most original aspects of the art of the Celts of the Carpathian Basin. In the second century BCE Celtic art was distinguished both by continuity, as shown by the late specimens of the "Hungarian Sword Style" and the Plastic Style, and by an important innovation, the increasing role of glass as a vehicle for art. The bead found in Vac (Hungary) derives from the large family of Punic amulets, but it is an imitation made in the Pontic region, and was a type highly prized by the eastern Celts. The appearance of rather conservative stylistic tendencies, however, is to be noted - the reintroduction of symmetry in the composition and the predilection for summary forms. Nonetheless, the Celtic masters' feeling for both angular and curved forms remained astounding, as can be seen simply by looking at the anklet found in Batina (Yugoslavia) or the pendant ornament found in ]aszbereny (Hungary). Continental Celtic art at its height extended its influence over insular art and it is possible to speak of its impact on the British Isles. The ornament from a chariot found in Brentford (England) is a significant example of the adoption of the running tendril scroll and of motifs that can be interpreted in differing ways. The central boss of the Witham shield demonstrates the importance both of high relief and of a composition based on the principle of the symmetry of rotation. Irish sword-scabbards are usually more finished than Continental ones, but their decoration reflects the innovations of the "Hungarian" and "Swiss" masters of the third century BCE. A continuous foliage pattern in low relief garnishes this open torc with buffer-terminals, which was discovered in a tomb. Forming part of a drinking service, the flagon was produced locally while the bucket was made at Tarentum. Found in a former channel of the River Seine, this bronze helmet is similar in conception to the Agris helmet. Here, however, the openwork areas are inset with enamel and gold leaf survives only on the central band. The decorative motifs employed also are more varied, involving S-motifs and triskeles. This magnificent object was discovered recently in a cave outside the area covered by Celtic art in the fifth century BCE. The helmet, covered with gold leaf, is decorated with four main bands either composed of vegetal openwork, inset with coral, or of palmettes in relief. The iron helmet is surmounted by a bird of prey made of bronze and enamel. A sandstone pillar statue depicts the left forearm of a human figure. Below, on the four sides, are curvilinear compositions. The scabbard is ornamented with the so-called 'dragon pair' decoration, which consists of two opposing S-motifs, or lyre with a schematic representation of dragon heads. This sword from a Celtic cemetery is bent following Celtic practices. The "dragon pair" which decorate it have been fleshed out and have been given a tail. This fragmentary scabbard (with sword) displays two affronted dragons either side of the centre line. The beasts are further defined by the use of punched or dotted background. A decorated chape of a scabbard displaying three animals in a triangular arrangement. Incised with an inverted pelta at the top and a curvilinear imaginary animal on either side. Below is an area which has been punched or stamped. This decorated scabbard displays scroll-work derived from Etruscan prototypes. The decoration on this and related scabbards displays elements similar to those found on Hungarian swords, including the use of birds heads. But distinctive to the scabbards found in the British Isles is their emphasis on compass-aided design, all over patterning and somtimes cross-hatching. One of the terminal roundels of the shield, this boss bears engraved ornament, which is dominated by typically insular hairspring spirals and sprung palmettes, comparable to that found on Irish scabbards.  For more on the history of Waldalgesheim Celtic crafts, see: Homepage.